Before we start talking about Gamebook Mechanics, we should first recognize the very basic elements of any game. In theory, a video game (or any other game) consists of two major events: input and feedback. In simple words, the player takes any action such as tilt the joystick, hit a button or move the pawn in a board game, etc and we have an input. For every input, there should be positive or negative feedback such as moving the character on the screen, hearing a sound or something else that provides the player with a clue if he or she is doing well or not. In my previous blogpost, I already mentioned that one of the most disturbing articles I've seen so far is the one named narrative is not a game mechanic by Raph Koster and based on his theory many people consider that games and story don't mix coming to the wrong conclusion that it is impossible to write a book which is also a good game. Just take another look at the basic game elements! Narrative is a form of feedback, isn't it? I think that, not only narrative IS a game mechanic, it actually is the best form of feedback. Raph Koster argues that "games can and do exist without narrative". He is absolutely right, they do, but... Remember the old arcade games where the gameplay was always the same except the opponents speed increased in every consecutive level? Sure, that did make the game more challenging, but how much closer to the final goal did it make you feel and how much feeling of accomplishment did that design approach provide to the players? "Kill as many enemies as possible and move on to the next level" was the motto of all games back then and there was no ultimate goal for us to achieve. My personal opinion is that having some storyline and narrative such as "You just left the Old Village on your way to the Ancient Forest. You can see the mountains standing proud out there beyond the tall trees and you are now a step closer to finding and killing the Dark Wizard, who has been terrorizing your people for centuries... You won the battle against the Dark Wizard and you are successful in your mission to free your people from evil! Everybody in the Old Village will live happily ever after"? Sure, a good narrative limits the replayability of the game as nobody wants to read the same paragraphs multiple times, but how many times do you want to replay the same scenario in the countless levels of a jump and run or a shooting game that doesn't have any narrative? We, the human beings, like diversity and we love having a final goal to reach, and the answer to those challenges in the art of making games lies in providing the player with an interesting storyline that includes diversified encounters and a clearly defined ultimate goal. Those vitally important needs were hardwired in our brains by mother nature through the evolution process of our species (you can read more about my views on that subject in my earlier post about psychology of games). If I have to summarize, I'd say that for the purpose of reaching the final goal of the adventure, the actual form of the feedback in games doesn't matter all that much as long as the player is given a clear idea if his performance is satisfactory or not. The feedback could be in the form of a sound, movement of an object on the screen or simple description in the form of text narrative. That being said, the real difference in mechanics between gamebooks and all other games is found mainly in the input methods, so next I'd like to compare for you how overcoming an obstacle in video games drastically differs from overcoming the same obstacle in the genre of gamebook adventures and to do so, I am going to use as an example the all-time-favorite Super Mario game and more specifically, how to test the player's performance when jumping over a deep chasm. 3. 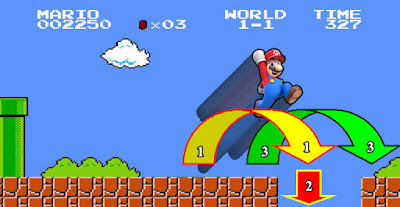 Ideally, IF the jump button is hit at the correct time (between too soon and too late) THEN Super Mario will make it safely to the other side. Unfortunately, we don't have the luxury of testing coordination and speed of the player in this genre. The only input method available to the author is the logic of the reader. Since it would be dumb to ask the gamer if and when he would like to jump, to make gamebook adventures dependent on the input, at this point, the designer must test the stats of the protagonist. The same stats that would have been built up earlier in the adventure through meaningful choices based on strong logic. An example of such test looks like: If your strength stat is greater than 10, you successfully make the jump. Otherwise you fall down to your death. A more complicated example would be: Add the number of your Stamina stat to your Strength skill. If the number is higher than 15, you make it to the other end and the adventure continues. If you fall short, your protagonist dies here. It is also very common to integrate some randomness: Roll 2 dice and add your strength skill to the result. If the number is equal or greater than 20 then you succeed and your adventure continues. If the number is lower than 20, you fall down in the chasm and die. Please note that skillchecks, dice rolls, flipping pages and so on, are not game mechanics. All of the above examples would be completely meaningless if the author failed to provide proper ways of increasing the protagonist stats earlier in the adventure. This is where the game part of a gamebook happens. For an example, there could have been an option to purchase a headband of strength earlier in the adventure or there could have been a paragraph where the reader had to choose between eating a good meal or picking up a fight at the tavern and the outcome turns out to be increased strength stat from eating the meal or loss of strength points due to the injuries suffered. See, the input in Gamebooks happens in the form of choices and decisions. It is up to the author to make sure those choices and decisions are meaningful and that they are based on strong logic rather than random dice rolls and player's blind guessing due to lack of relevant information. I believe that there are two forms of narrative feedback in gamebook adventures: instant and delayed. In the examples above, leaping over the chasm is a form of delayed feedback (the gamer performance up to this point would be considered satisfactory if the protagonist is successful in the jump). A form of instant feedback is the instructions to increase the character strength by 2 points after making the choice to eat the meal instead of picking a fight at the tavern. As I already pointed out in my previous post, I am not claiming that Gamebooks represent the best of all game genres nor I am claiming that they are any better than video games. All I am saying is that due to the lack of other game mechanics, Gamebook Adventures provide the most diverse storyline and force the player to make the most meaningful choices, because they provoke critical thinking and force the gamer to assess different situations and then select the most rational action for the best possible outcome. I just wish that more of this kind of game mechanics, providing a lot of learning and personal improvement value to the player, would be implemented in video games. Just imagine how much more interesting and exciting an adventure like Diablo 2 would have been, if it was putting the gamer in situations that require certain meaningful and important choices altering the outcome of the story one way or another. In the next post I will talk about the most important Gamebook Mechanic: Meaningful Choices.